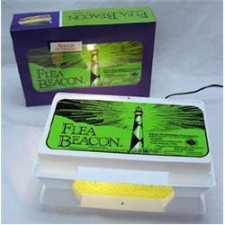 Fleas are attracted to thsi flea beacon's heat that is given off by the lightbulb underneath the top of the flea trap. When fleas jump in they find themselves trapped. Traps with small upper trays allow the fleas to jump through without rebounding off the tray which is covered with a sticky strip. This product breaks the breeding cycle by catching adult fleas before they lay eggs. No chemicals, pesticides or professional exterminators needed, easy design to move from room to room when needed. Traps with small upper trays allow the fleas to jump through without rebounding off the tray. Breaks the breeding cycle by catching adult fleas before laying eggs. No chemicals, pesticides or professional exterminators. We have four cats and a dog and I keep a flea trap in every room where they go (we keep them out of the dining room and kitchen area), a total of four rooms where they 'hang out'. Between the flea traps and Advantage II flea treatment, we keep them well under control. The dog goes out to 'take care of business' and will no doubt bring in new fleas, but at night, they are soon trapped. The real trick is not to have any other lights on at night and the traps act like a nightlight as well. The older metal Happy Jack traps were more substantial, but the Flea Beacon does project more light to draw the fleas to them and they trap them very well.